I know that technically it is still Summer (first day of Fall is Sat the 22nd) but I wanted to get a jump start on my Halloween projects so the house will be decorated the entire month of October and I thought you might feel the same. Halloween is one of my favorite holidays, and I love decorating for holidays! My favorite kind of decorations are the ones you can make yourself, and the ones that are somewhat functional. 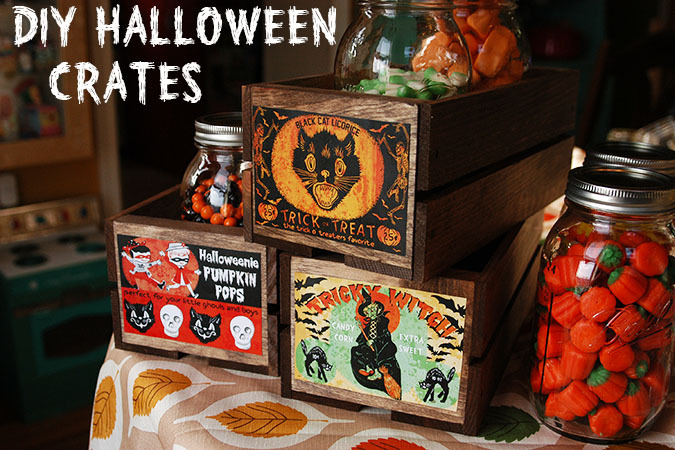 These little mini crates are great for storage that is also festive. Keep them on a kitchen counter and hold your spices, put them on a a shelf and fill them with jars of Halloween candy, or put them in your bathroom to hold soap, and other bathroom essentials. 2. Have labels printed (I had my printed by Staples for a little over $1, and they print on a laser printer so you don’t have to worry about the inks smearing) cut them out. 3. 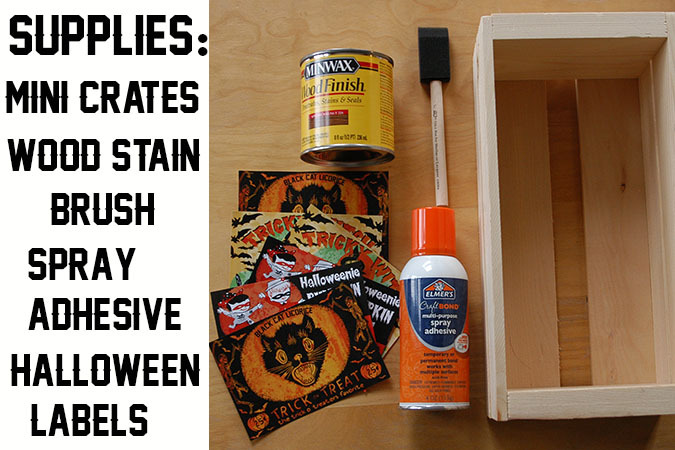 Use the spray adhesive in a well ventilated area, spray the back of each label and press it onto the side of the crate. Voila…super easy, and actually pretty fast too! Please remember these labels are for personal use only, not for re-sale. Tagged craft, crafty, DIY, halloween. Bookmark the permalink. these are so cute! 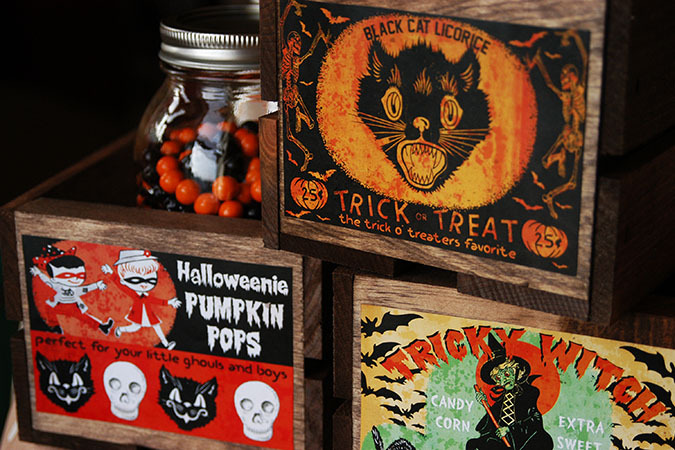 i was just whining that vintage halloween stuff is so hard to find and how most modern stuff isn’t very cute! these lables would be cute on old jars too! amazing! where do you find the time for… everything?! 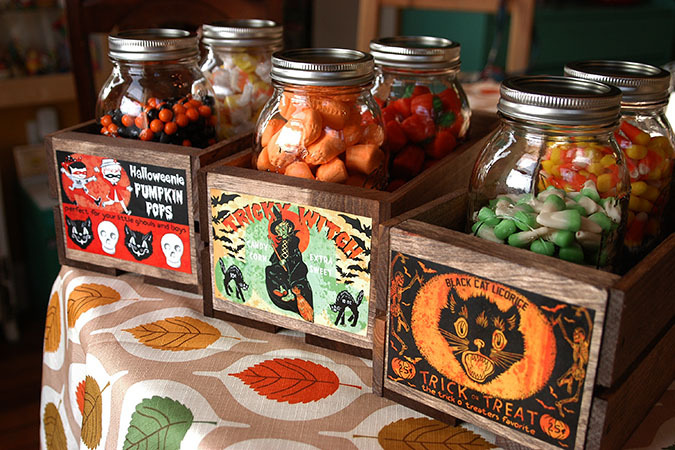 I love Halloween decorations with a vintage feel. Thanks for sharing! No AC Moore in California! Boo! thezenofmaking, you are very welcome! I love these!! Thanks for sharing the printables – I will definitely be giving it a go. Pinned! Stopping by to pin your crates. I have some vintagey looking chocolate bar wrappers that I have saved not knowing what to do with them. Now I know! Bliss, oh the candy bar wrappers is a great idea! Jenn, so glad you like them! These are just perfect! Thanks so much for sharing them! 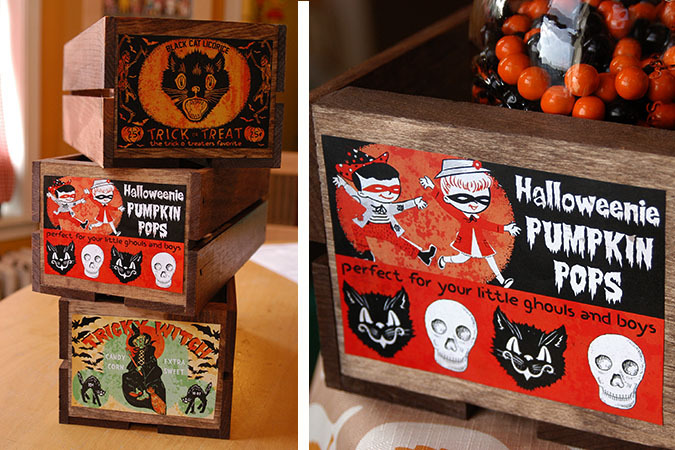 such a great idea, if your crate had a solid bottom, these would make cute candy holders for trick or treating! Have you ever considered or made desktop backgrounds? I think your style of art and images would be fabulous for that. haley, I hadn’t but thanks! Robert, thats a great idea! Oh gosh I just love this! How big are your crates? I picked some up at Micheal’s Crafts yesterday and they’re great, but 15″ long, which feels huge!